The 7th “Karl-Heinz-Höhne Award for Visualization in Medicine” (in short medvis-award) is now accepting submissions. Besides eternal glory, the top contestants of this biannual competition will receive in total 1.000 EUR, donated by BrainLAB AG. You can only apply if you are a young scientist with a diploma thesis or with up to two publications (published or to be reviewed) in the field of medical visualization. Does this sound like you or someone you know? Find out more about the award here and check out previous winners here. Announcing VCBM & MedViz 2016! It will be in Bergen, Norway. Bergen, for those of you that never visited, is a truly amazing city situated between majestic mountains and a beautiful harbor. You could do worse! “The Gateway to the Fjords of Norway”, people! Additionally, also speaking from personal experience, the Bergen Vis group is filled with awesome people that do great research. If this is still not convincing you of the epicness, next year the 10th annual Medviz conference will be held at the same time! ‘So where do I sign up?’ I hear you thinking. The official website describing all the details is here, there is a Facebook page for you to like (if not love!) here and even a Facebook event here! VCBM 2015 Chester (UK) call for papers and posters: Deadlines imminent! 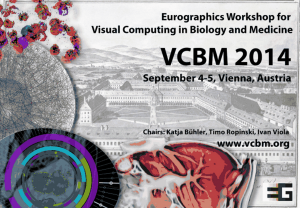 The “Call for Papers and Posters” for VCBM (AKA Eurographics Workshop on Visual Computing for Biology and Medicine) 2015 was released a while ago. As you probably already know, VCBM is an excellent venue for medical visualization work and this year it will be held in Chester, UK. The deadline for full paper submission is June 21st and the posters need to be submitted by August 7th. Don’t miss this opportunity to present your work at this excellent location and please take a look at the website for more details. 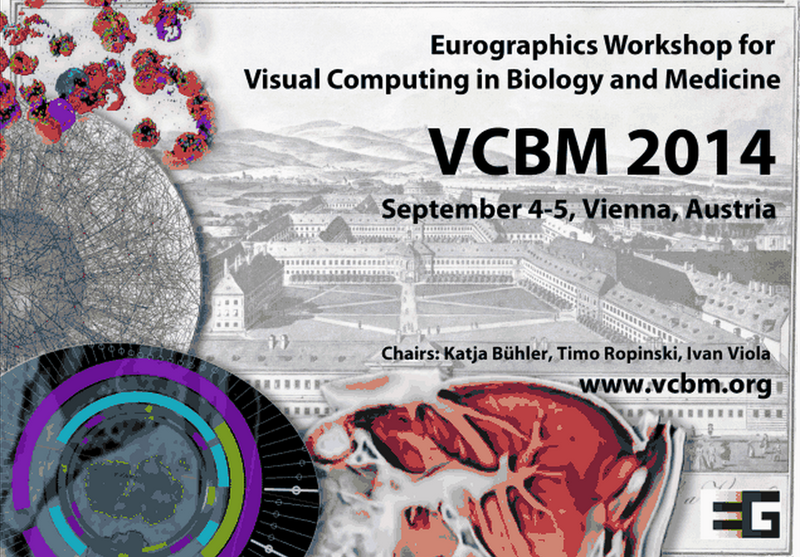 VCBM 2014 Vienna (Austria) – Call for papers and posters! The “Call for Papers and Posters” for VCBM (AKA Eurographics Workshop on Visual Computing for Biology and Medicine) 2014 has been released! 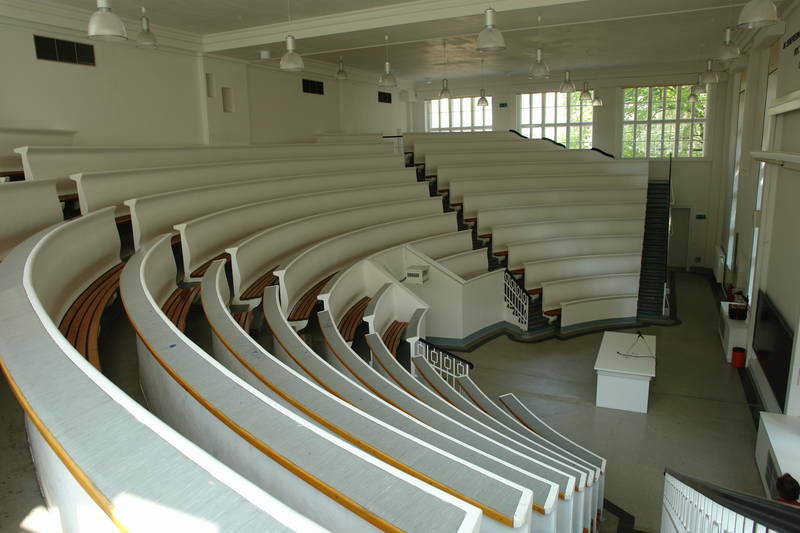 VCBM is an excellent venue for medical visualization work and this year it will be held in Vienna, Austria. The deadline for full paper submission is June 19 and the posters need to be submitted by August 7. Don’t miss this opportunity to present your work at this excellent location and please take a look at this website for more details. In other news: did you know our website also features a conference calendar that you can add to your personal calendar? Start submitting those papers and posters for VCBM 2014! The 6th “Karl-Heinz-Höhne Award for Visualization in Medicine” (in short medvis-award) is now accepting submissions. You can only apply if you are a young scientist (m / f) with a diploma thesis or with up to two publications (published or to be reviewed) in the field of medical visualization. Does this sound like you or someone you know? Find out more about the award here and check out last year’s winners here. The submission deadline is the 4th of May and the lucky winners will be receiving their award at VCBM 2014 in Vienna, Austria. The ‘Rainbow Colormaps – What are they good for? Absolutely nothing!’ post, written in August. A classic: ‘Siemens unveils MR-PET prototype’ that dates back all the way to 2007. The ‘VCBM conference report EG VCBM 2012 Norrköping (Sweden) Report’ written in October. The newly introduced pages: Jobs, Conference Calendar, Datasets and Software also got a lot of viewing love from our visitors. I started writing this post in the train from Norrköpping back to Stockholm Arlanda airport after visiting the truly excellent EG VCBM 2012 (Eurographics Workshop on Visual Computing for Biology and Medicine). While enjoying the beautiful view on the stunning Swedish landscape that features many lakes, trees with autumn leaves and a nice autumn sun, I briefly summarized the conference highlights. Please note that these were the conference highlights for me personally, and are not necessarily a reflection of the actual conference highlights. There were so many great talks, I lost count, but in the interest of not making this blog post drag on for too long, I’ll restrict myself to just briefly summarizing a couple of them here. The first day started with a word of welcome from the chairs Timo Ropinski and Anders Ynnerman and an excellent keynote by Anders Persson (Director of the CMIV): ‘Visualization of Quantified Medical Image Data – Key to the Future?’. 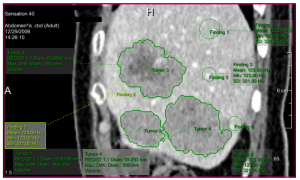 While showing us beautiful datasets acquired from Dual Energy CT (DECT), he stressed the importance of making quantified imaging data usable in clinical practice. This can be achieved by working in close collaboration with medical centers to make sure the techniques we are developing are usable by and useful to clinicians or medical researchers. Dual-energy CT (DECT) with two X-ray sources running simultaneously at different energies allows obtaining additional information about the elementary chemical composition of computer tomography scanned material . The first session of the first day, Tractography and Connectivity, featured a talk by Anne Berrescalled ‘Tractography in Context: Multimodal Visualization of Probabilistic Tractograms in Anatomical Context’ . Her approach is a way of handling the visibility issues that arise when presenting probabilistic tractograms within anatomical context. 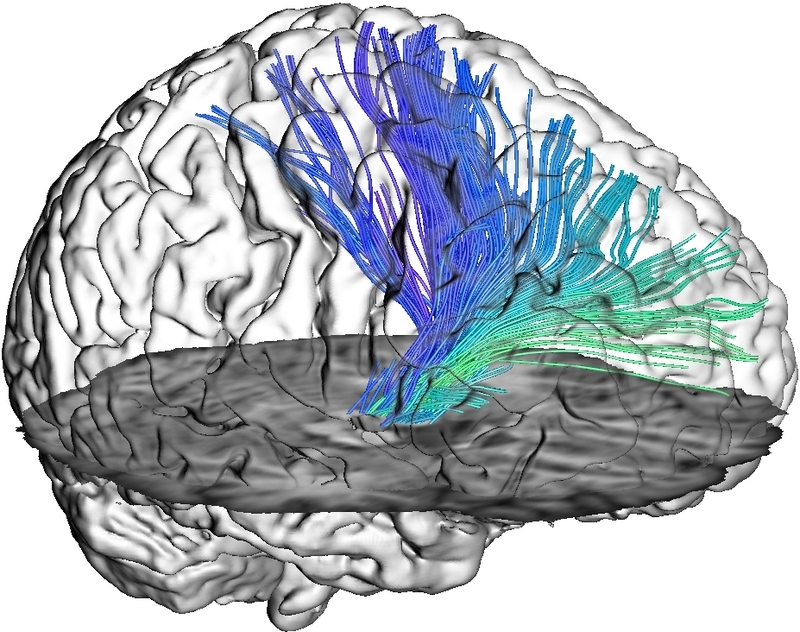 Probabilistic tractography data is presented in a ‘glass brain’ rendering that provides anatomical context together with an MRI slice plane, in a collaboration with neurological domain experts. 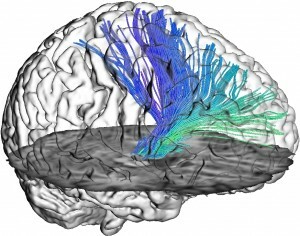 Tractography data in anatomical context . In the Ultrasound session, the talk by Daniel Tenbrinck entitled ‘Impact of Physical Noise Modeling on Image Segmentation in Echocardiography’ really stood out for me . Not only was it presented extremely skillfully, but the authors made a convincing argument against the frequently used Gaussian noise model assumption and demonstrated the positive effect of chosing a more suitable model such as the Loupas model. 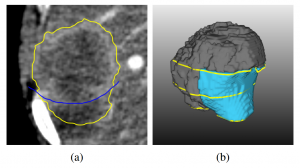 In this same session, Veronika Solteszova and Linn Emilie Saevil Helljesenpresented a new way of filtering 3D ultrasound using lowest-variance streamlines that reduces noise in 3D ultrasound datasets with impressive results . Raw 3D ultrasound scan on the left and a visualization of the same dataset ﬁltered with the lowest-variance streamline method . The final session of the day, on Multimodality included a great talk by Florian Weilerpresenting his work ‘On the Value of Multi-Volume Visualization for Preoperative Planning of Cerebral AVM Surgery’ . In the surgical treatment of cerebral arteriovenous malformations (AVMs), thorough preoperative planning is required using information about the arteries and veins of the lesion from different image sets. 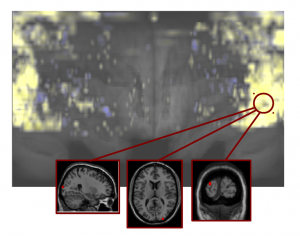 The authors merge these image sets and visualize them in an interactive application. 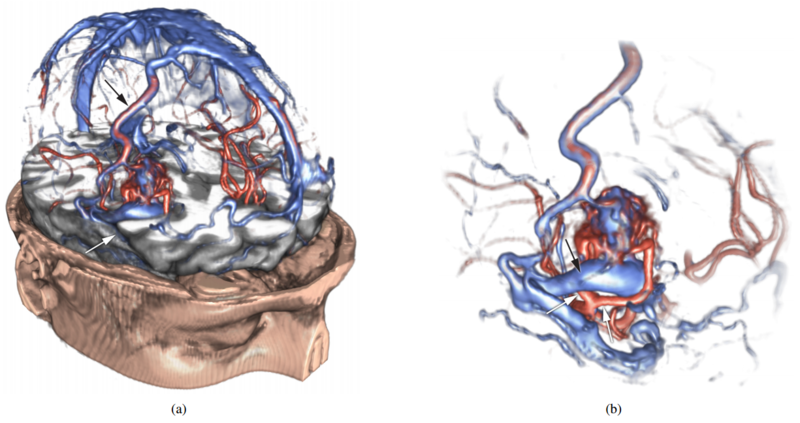 Planning of Cerebral AVM Surgery . Before making our way to the conference dinner, we were given a very special tour of the universe by Anders Ynnerman. I’m typically not at all interested in space stuff, but this was something else! Anders actually showed us the entire universe in the Dome, using real data from NASA. Besides the visually stunning features of this tour, Anders managed to make it a truly amazing experience by providing commentary full of interesting anecdotes and impressive facts. The feeling that you get when experiencing all this is very hard to describe, so I will not even try. But I will say this though, if you’re ever in the area and get the chance to see this, go for it! On the second conference day, the Segmentation and Simulation session’s second talk presented by Frank Heckel ‘Sketch-based Image-Independent Editing of 3D Tumor Segmentations Using Variational Interpolation’ was also very interesting . By allowing the user to intuitively draw adjustments on single slices, automatic segmentations can easily be adjusted by medical experts. This is currently shown on CT, but since the adjustments are not image-based, the technique is valid for arbitrary modalities. Sketch-based segmentation editing: (a) initial segmentation (yellow), manual correction (blue) and (b) 3D result after editing with our variational-interpolation-based approach . After this session, the Visual Computing Systems session started with the impressive ‘Visually Guided Mesh Smoothing for Medical Applications’ talk by Tobias Moench . The authors provided a way of interactively smoothing a mesh by trying out several parameters and simultaneously show the effect of these settings on mesh quality by using a GPU mesh smoothing implementation. By calculating the model quality for several parameter combinations, an optimal set of smoothing parameters can be automatically suggested as well (click to see a cool realtime mesh smoothing video). The medvis.org overlord who also happens to be my supervisor, Charl Botha, presented ‘BrainCove: A Tool for Voxel-Wise fMRI Brain Connectivity Visualization’ in the same session . I am obviously biased here, but I thought it was an interesting and entertaining presentation. I mean it featured the BrainCleaver, what’s not to like? of the brain, viewing from the anterior in the middle to posterior at the two sides . The final session of the second day, Biology and Radiology, was concluded with an excellent talk by Katja Mogalle ‘Constrained Labeling of 2D Slice Data in Clinical Application’ . Katja did this as her bachelor project (yes, you read that right!) with Siemens. She has thought of an algorithm that uses constraints to place annotation labels in 2D slice data so that they don’t occlude the image, but are close enough to be linked to the area that they describe. Placement of seven labels in a viewport showing a liver via the shifting approach . Unfortunately we had to catch a flight, so we had to miss the keynote. The best paper award went to “Atomistic Visualization of Mesoscopic Whole-Cell Simulations” presented by Martin Falk and the best poster was “Efficient projection and deformation of volumetric shape and intensity models for accurate simulation of X-ray images” presented by Moritz Ehlke. My personal favorites of all the talks were the ones by Daniel Tenbrinck, Tobias Moench and Katja Mogalle. To conclude this already far too lengthy post, I’d really like to thank the organizers of this excellent workshop. Interesting talks, a beautiful location, good food, great people and a guided tour of the universe. I’m not sure how any conference will ever top this!